1. Heat oven to 350°. Grease bottoms only of 2 round pans, 8 or 9 x 1 1/2 inches, with shortening. Make cake mix as directed on package, using water, oil and egg whites. Pour into pans. 2. Bake 8-inch rounds 27 to 32 minutes, 9-inch rounds 23 to 28 minutes, or until toothpick inserted in center comes out clean. Cool 10 minutes. Run knife around side of pans to loosen cakes; remove from pans to wire rack. Cool completely, about 1 hour. 3. Cover large flat tray or piece of cardboard with aluminum foil. Attach candy cane to open end of each cone, using melted candy coating, to make ice skates; let stand until set. 4. Arrange cake rounds with sides touching on tray. Frost top and sides of cake with frosting. Sprinkle with coconut, pressing gently so it stays on frosting. 5. Use large black gumdrops for eyes and buttons, large orange gumdrop for nose and small black gumdrops for mouth. Arrange pretzel rods for arms and cones for feet with ice skates. Store loosely covered at room temperature. 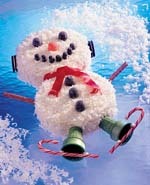 Outfit your snowman with earmuffs and a scarf. For earmuffs, place a cream-filled chocolate sandwich cookie on each side of snowman's head, and connect them across the top of the head with black shoestring licorice. For the scarf, any flavor of chewy fruit snack roll will work.